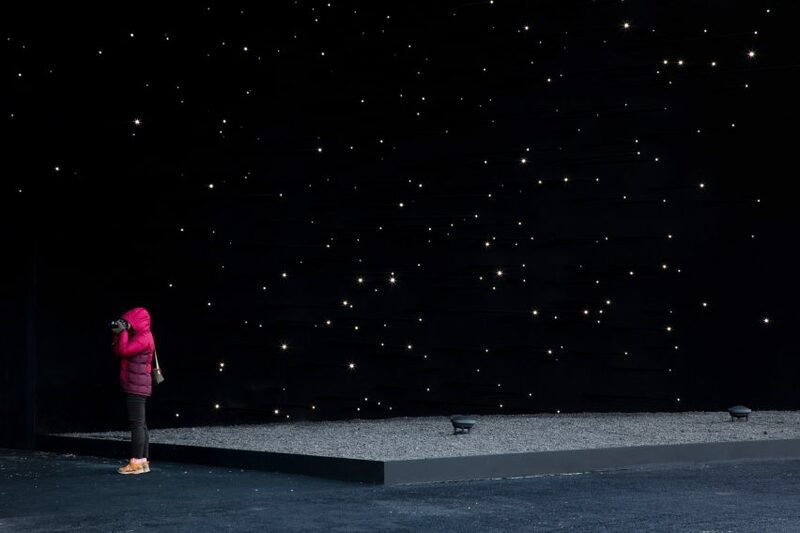 Asif Khan has unveiled a pavilion at the Pyeongchang Winter Olympic Games in South Korea, described as the “darkest building on earth”. Vantablack VBx2, is a sprayable version of Vantablack pigment, which British artist Anish Kapoor controversially acquired exclusive rights for in 2016. 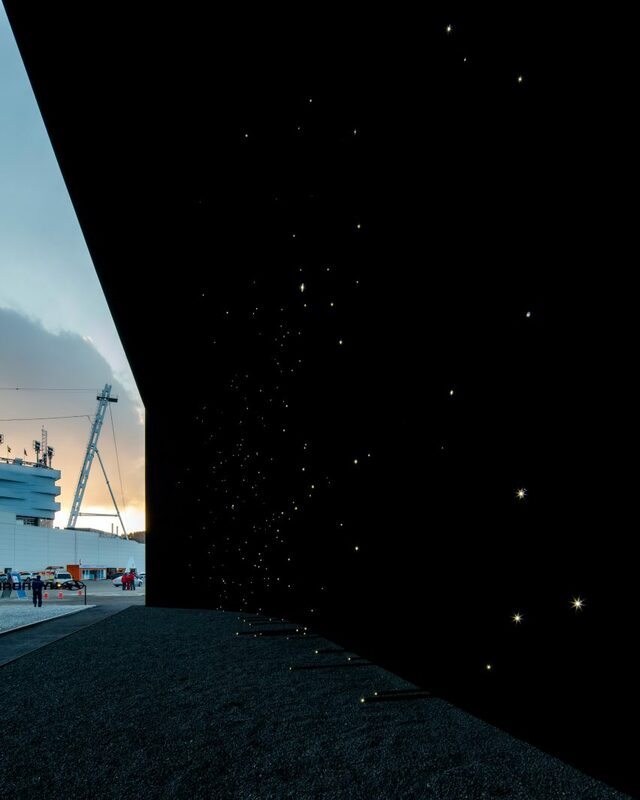 Rods tipped with tiny white lights protrude from the “super-black” parabolic curves of all four sides of the pavilion, giving the impression of stars suspended against the darkness of space. Speaking to Dezeen, Khan – who describes himself as a “closet astronaut” – said he “wanted to create the impression of a window cut into space”. “It’s a preoccupation of mine, trying to create experiences to better understand where we are now as humans, placing ourselves in the big picture,” said Khan. The sprayable Vantablack VBx2, is so black that it is almost impossible for the human eye to perceive the shape of an object it coats. “It changes as you approach it. From far away you see it as a surface of blackness, it just looks like a void,” said Khan. 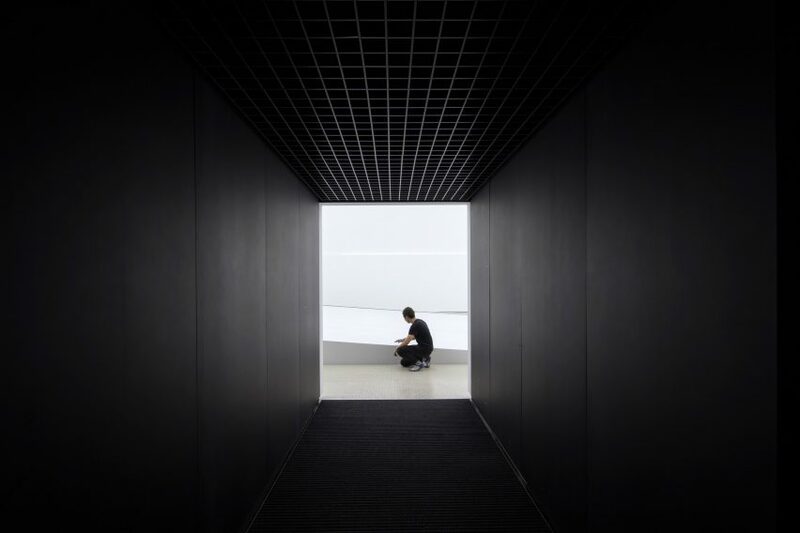 The light-absorbing power of Vantablack VBx2 and the optical illusions created by the lights against the curved walls is almost too difficult for humans to comprehend, according to the architect. 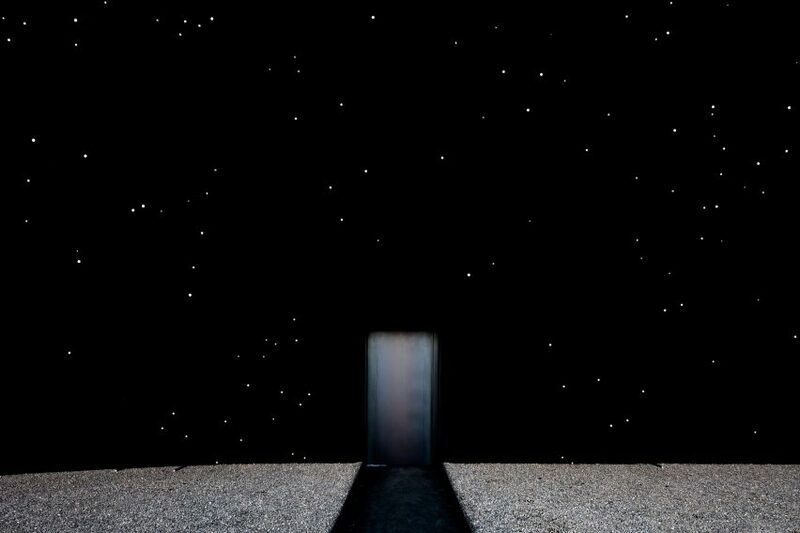 “There’s a tension between wanting to know what form something is and actually accepting that it could be formless – you’re looking at infinity,” he said. 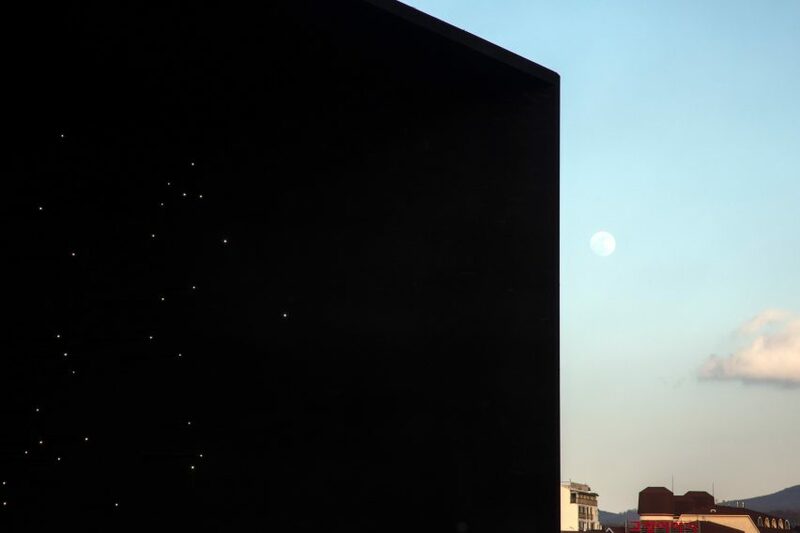 Khan had been in contact with the scientists behind the original Vantablack, since 2013, after reading a paper on the subject while researching how to create a building that could be as black as space. “They were quite taken aback that someone would think to try and apply their materials in the built environment,” he said. Khan and the scientists first collaborated on a proposal using the material for the UK Pavilion at Milan Expo 2015, which was eventually shortlisted. In the meantime, the manufacturers devised Vantablack VBx2, a more versatile material better suited to architectural application. The light-absorbing pigmented coating is suspended in a carrier solution that allows it to be sprayed onto larger areas. “This was the real challenge, actually going from the lab to full scale manufacturing, which they pulled off. It’s amazing,” said Khan. 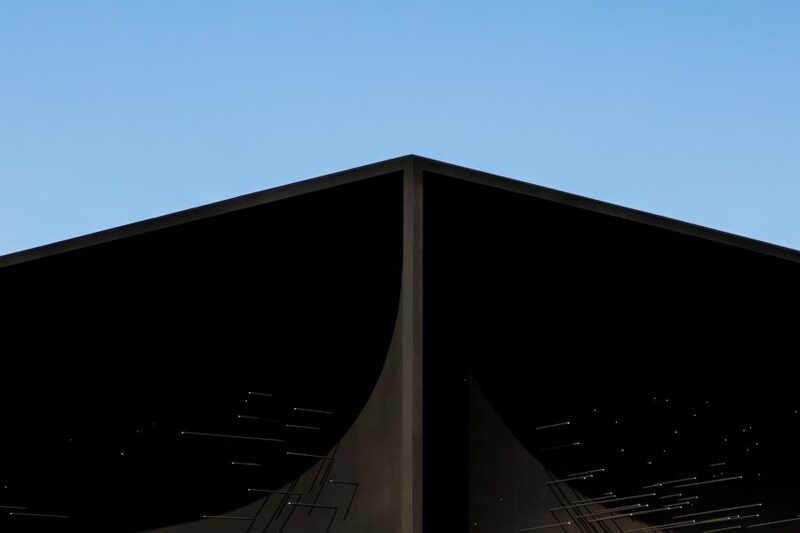 The Vantablack used for Khan’s building is structurally different to the original pigment. Whereas the black Kapoor has rights over uses microscopic stems to absorb light, VBx2 has a sponge-like structure at micro level. 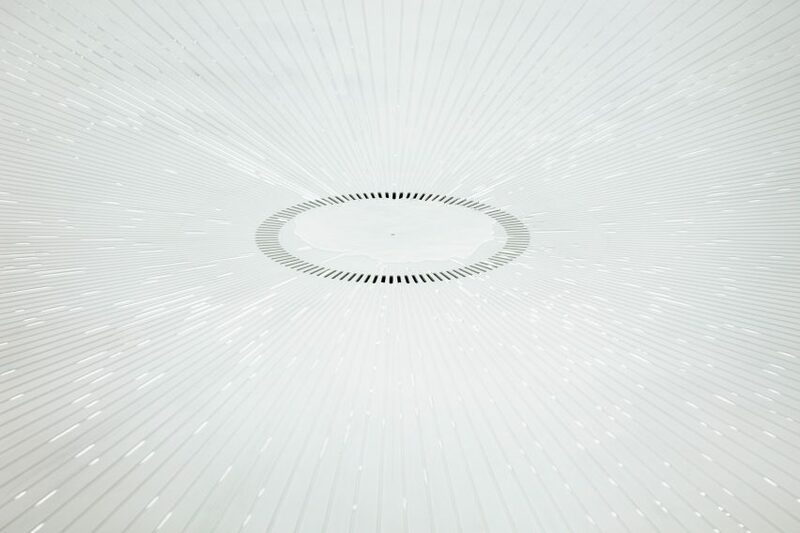 To build the PyeongChang Winter Olympics pavilion, the steel substructure was bolted together on site and then clad to create the curved surfaces. A scaffold was then erected around the pavilion and tented, creating conditions suitable for spray painting. During construction the team had to contend with the mountain climate and temperatures between minus 15 and minus 25 degrees Celsius. “It’s a challenging climate to work in, because of the temperature, because of the extreme high winds. On an Olympic Park you don’t have much of a time frame to get anything wrong,” said Khan. 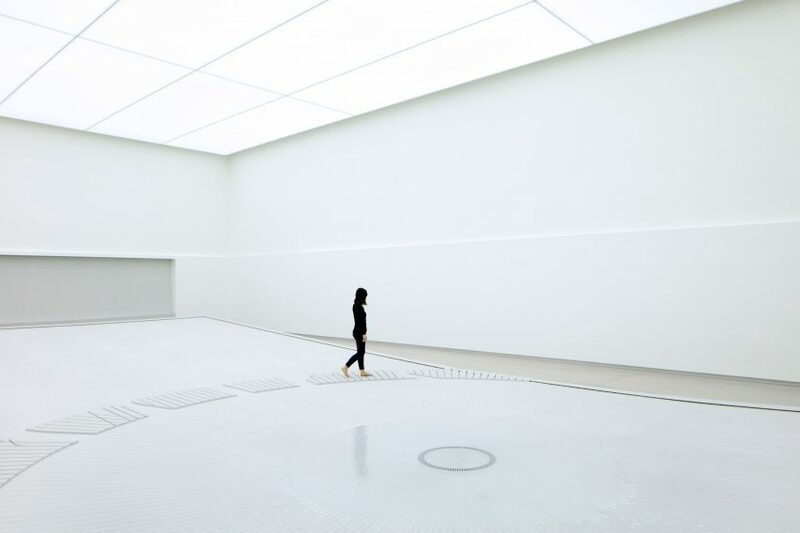 When it opens on 9 February 2018, visitors will be able to enter the pavilion through a dark corridor that opens into a bright white space lined with solid-surface material Corian. Channels have been carved into its surface as part of a multi-sensory hydrophobic water installation also designed by Khan. Walking across a pathway, visitors interact with sensors causing 25,000 water droplets a minute to whizz along the channels, colliding and splitting before pooling into a lake. 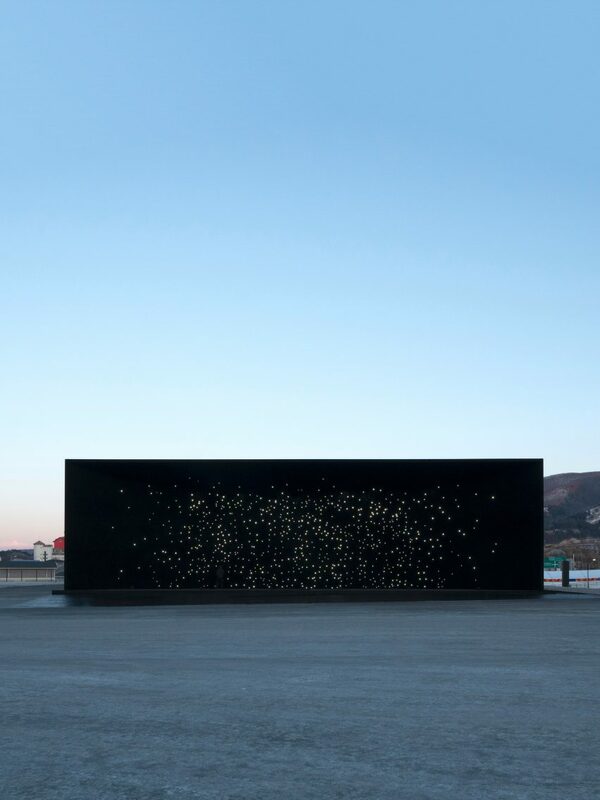 The 35-metre by 35-metre building was commissioned by Hyundai Motor as part of its global art initiative, with the pavilion’s space theme aligning with the car manufacturer’s latest technology: a Hydrogen Fuel Cell vehicle. The “stars” on the outside represent the chemical element on a cosmic level – gaseous balls shining due to the thermonuclear fusion of hydrogen into helium at their core. Inside the pavilion, the liquid embodies hydrogen at a more human scale, as two atoms of hydrogen bond with one oxygen atom to form water. The building also references its location in South Korea. The curved wall of the building makes it star-shaped in plan, yet rectangular in elevation, while the shape formed by the intersection of the curved walls echoes the swooping roofs of traditional temple architecture. Khan is no stranger to inventing original interactive structures. At the Astana Expo 2017 in Kazakhstan, the architect designed a pavilion that explored the origins of energy with a 360-degree wrap-around sound and animation installation. For the 2014 Sochi Winter Olympics he created the “Mount Rushmore of the digital age”, which projected 3D models of visitors faces through a fabric membrane facade, and at the 2012 London Olympics Khan designed a giant beat box for Coca Cola with panels that could be played like a musical instrument. Photography is by Luke Hayes, video is by Jun-Beum So.